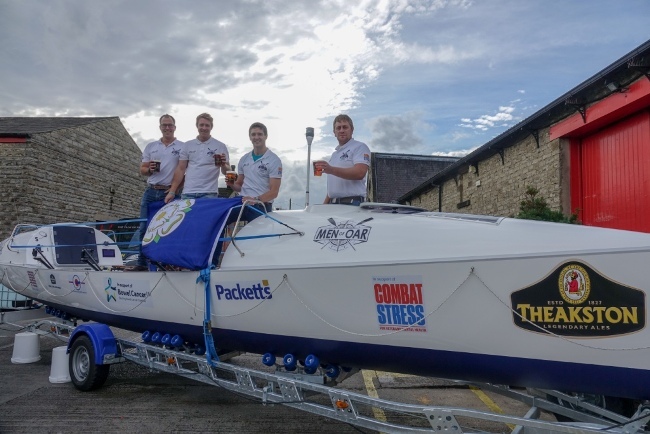 A North Yorkshire brewery’s “oarsome” fundraising event – which pitted beers from the north against their southern counterparts – has helped take a charity rowing team a step closer to its £250,000 target. T&R Theakston Brewery’s “Great British Beer Off” raised more than £3,000 for the “Men of Oar” four-man team – which includes Will Theakston, son of brewery executive director Simon Theakston – who next month (December) will be rowing 3,000 miles across the Atlantic for two charities, Bowel Cancer UK and Combat Stress. The event, which was attended by hundreds of beer and live music lovers, saw the north being represented by Camerons, Daleside, Northern Monk and, of course, Theakston’s, whilst Fuller’s, Dark Star, Beavertown, Adnams and Shepherd Neame were in the southern corner. The entertainment was provided by local bands, Citizen Smith, MG Band, Dan Burnett and Hot Sauce, and Harrogate Based Company, Trufflehunters, provided the barbeque. Victoria Bramley, Theakston Brewery’s Marketing Manager, said: “We would like to say a huge thank you to everyone who came on the day and supported our ‘Great British Beer Off, which was in aid of the ‘Men of Oar’. “All four members of the team were in attendance at the beer festival giving guided tours of the boat, which will be their home for the 45 days of their epic journey across the Atlantic. “The beers went down a treat and I’m happy to concede that when it came to the judging process there wasn’t any north/south divide. However, if there were any winners, I would have to say it was those from the north by a creamy head!